Early this morning going out on the balcony, I looked up on a star chart app to verify it was Jupiter I was seeing. Then I noticed the alignment of Mars, Saturn, and Pluto on the app. Never being able to identify it before, I stared at where Pluto should be and I'm pretty sure I saw it. My only question is - since it's said that planets shine and stars twinkle, it did seem that Pluto was flicking a bit. Is this normal? Something to do with the relatively low luminosity and greater length of space? Pluto is something like magnitude 14. The limit for the human vision is somewhere between magnitude 6 (widely accepted) and 8-ish (highly trained observers with perfect vision in ideal conditions using special techniques - and it's a bit controversial anyway). There's zero chance that was Pluto. It was definitely a fixed star. As Florin correctly stated, it can't have been Pluto. You have probably looked at it and you have even gotten its light in your eyes. That little itty bitty shine just has no chance to make your retina do anything (edit: Interesting link in the comments. Might be that people actually can sense single photons. Doesn't help at all to see Pluto though). 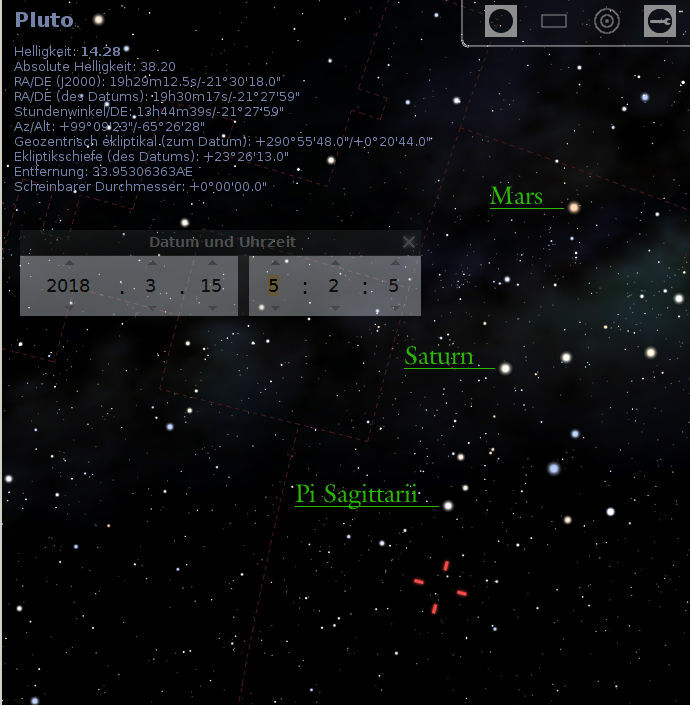 The red crosshair is where Pluto should be and Stellarium doesn't bother to color a single pixel because Pluto is about 14.28 mag. 5 mag difference mean 100 times dimmer, so Pluto is at least 10000 times less bright than many of the stars that you see in this image, let alone the two planets (Mars is about 26 times closer than Pluto atm.). Not the answer you're looking for? Browse other questions tagged pluto or ask your own question.